At the risk of starting with the very basics, apps are to smartphones what software is to personal computers. As you spend more time on smartphones, more programs — known as apps — are being developed to run on your phone. Most apps are offered by large companies as another option for their customers to be in touch with and interact with what they offer. The financial institutions that you do business with — banks, mutual fund companies, brokerage firms, and so on — are a common example. Following is some advice for how to make the most out of apps and sidestep common app pitfalls and problems. Though they haven’t gotten the attention that computer viruses, computer malware, and computer ransomware attacks have garnered, similar problems have arisen with smartphone apps. The worst of the lot can end up tracking and spying on you. Some are a scam and/or some sort of virus or malware. In addition to those issues, you should also check out the background and agenda of any company offering a financial app and how it may be making money from the app. Most apps are nothing more than glorified advertising from the company behind the app. Sure, they may dangle something seemingly helpful (for example, offering a free credit score, stock quotes, and so on), but ultimately you should uncover what their agenda and reputation is. Many free credit score apps, for example, make money from affiliate fees from credit cards they pitch you. Do your homework and research an app before downloading and beginning to use it. Check with more than one independent source and read independent reviews, especially those that are critical and less than flattering. And stay far, far away from the many apps that claim they can show you how to make big bucks doing very little from the comfort of your own home. You can use apps to do more and more tasks that previously needed to be done online and through a regular computer. The dizzying pace of technological change continues as many smartphones function as mini-computers in your hand. Although some apps are provided free of charge by companies that are seeking to promote their own services, others charge modest fees (like a software company does) because the app is all they are selling. You will notice that most of the companies recommended in this chapter are fairly large companies with lengthy track records of success. For sure, technology is disrupting and changing many industries and companies. But, that doesn’t mean that you should only do business with firms that exist solely online, in the cloud, and so on. Research the history of companies that you are considering doing business with. When seeking the link for a mobile app, get that link and download the app from the company’s website so you’re sure you are getting their actual app rather than a knock-off or a fraudulent one. Before downloading and using an app, you should question the need for it and consider the alternatives. Remember that the company behind the app wants to tie you to it so you’ll buy more and spend more with them. Is that your goal? You likely have your phone with you all the time. Do you really want this app running and in your face all the time? Maybe, maybe not — think about it and examine the alternatives. Some folks need and want extra help and hand-holding when it comes to licking the problem of overspending or simply feeling on top of where their money goes and doing something constructive about it. Many websites and related apps purport to address this problem but in reality have massive conflicts of interest through the kickbacks (affiliate relationships) they have with companies that they direct business to. Advertising is also a common problem. There are some apps that to date have overcome these problems, but things can change, so don’t take my current recommendation in this space as a forever endorsement. That said, the Goodbudget app is simple and practical. The basic version provides you with up to one year of expense-tracking history in ten main categories (envelopes). There is also a paid or premium version ($45 per year), which provides up to five years of expense tracking with unlimited categories as well as email support. Start with the free version and then deciding in the future whether an upgrade is worth your while. Be leery of apps that have you store your credit-card information in the app (for example, games, iTunes, and so on) so you can automatically charge purchases. For some folks, this can quickly lead to overspending. Going out with friends or doing other activities often involves spending money. So long as you can afford these outings and you’re hitting your savings targets and goals, great! Regardless, though, make sure everyone is paying her share. Sometimes you may have to cover for someone who is low on cash or left his wallet at home. Other times, one of your friends can help you out. Apps like Venmo, Square Cash, Gmail/Google Wallet, and PayPal can help you get paid and allow you to pay others to whom you may owe money. Pay close attention to possible fees, especially when using a credit card. Venmo, for example, hits you with a 2.9 percent fee on credit-card transactions but doesn’t charge a fee for other transactions, including usage of debit cards. PayPal has no fees on direct money transfers but does charge for debit and credit-card transactions. Some apps are simply designed to save you money. GasBuddy, for example, will show you the price for gasoline at various service stations in a local area. It’s free for consumers to use. 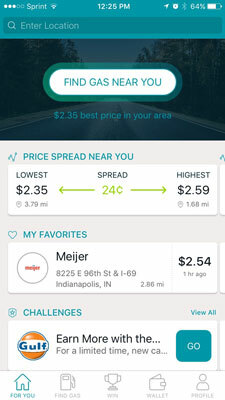 GasBuddy can help you save money on gas. Especially when going on lengthy car trips, car tolls can add up quickly. Tollsmart Toll Calculator is a low-cost app that enables you to compare toll costs for alternative routes. The Waze app can help with navigating traffic. Somebody should really combine a navigation app with the information from a toll app so that drivers can select routes that save time and money! CamelCamelCamel is a price tracker that scans items on Amazon, shows you their price history, and sends you alerts when a product you’re interested in drops in price. PriceGrabber scans items everywhere online, although its website is much easier to use than its app. The St. Louis Fed’s signature economic database — FRED, which stands for Federal Reserve Economic Database — is accessible through an app. Here’s a rare case where you can have a wealth of data on the economy and financial markets at your fingertips and never be bombarded with ads or plugs to buy things. 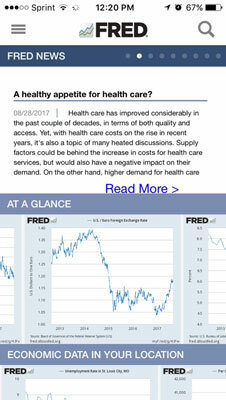 The FRED app puts financial data at your fingertips. Of course, many banks, investment companies, brokers, and so on have apps. So if you have a favorite investment firm or bank, check out what it offers. For its broad array of cost-effective funds with solid long-term performance, I use Vanguard’s app. Just because you have an app that gives you 24/7 access to your accounts and financial market data doesn’t mean you should obsessively follow these things. Doing so will likely make you a worse investor.